In 1547 Beaujeu succeeded Méric Boldoytre as architect of the cathedral of Auch (Gers France). He designed and built the western part of the church, especially the three main portals with the lower story of the porch. This work bears his signature, with the dates 1560 and 1567. A son of Robert Grappin. He worked with his father on the church of S. Gervais et S. Protais at Gisors (Oise, France) until his death. 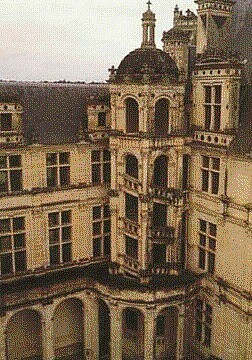 His name disappears from the accounts of the building in 1547, and was replaced by Pierre Monteroult. woodworker (intarsiatore) and architect; b. 1500; d. May 8, 1555. Battista belonged to a famous family of wood carvers which flourished during the fifteenth and sixteenth centuries in Italy. He was a protégé of Pier-Francesco Riccio, majordomo of Duke Cosmo I dei' Medici, and was much employed in the improvement of the Palazzo Vecchio. There is a ceiling by him in the second story of the palazzo on the side toward the Uffizi. The curious door which he built for the church of S. Romolo is preserved by Ruggieri. His most important work is the loggia of the Mercato Nuovo of Florence, which was begun by the order of Duke Cosmo I, August 26, 1547. 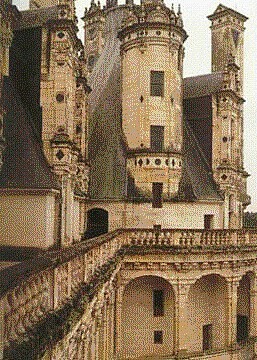 Domenico da Cortona, Château de Chambord (France: 1519-47).